Those of you who have been following my recipes closely will notice that I add jaggery to many chutney and curry recipes. 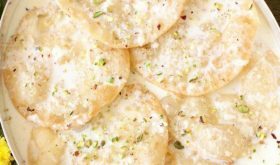 I like to add a hint of sweet which balances out the flavors in many Andhra style dishes. Try this everyday vegetarian chutney that is eaten with warm rice, a dollop of ghee and sliced onion by the side. Heat oil in a vessel, add cumin seeds, urad dal, channa dal, red chiilies and saute for 3 mts. Add green chilies, garlic and dondakaya pieces and saute for 8-10 mts. The dondakaya should be slightly brown as shown in the picture above. Turn off heat and allow to cool. Grind all the above ingredients to a coarse paste, adding tamarind, salt and jaggery. Add 1 to 2 tbsps of water, if required. Remove to a serving bowl. In a small pan, add a tsp of oil and once hot, add mustard seeds. 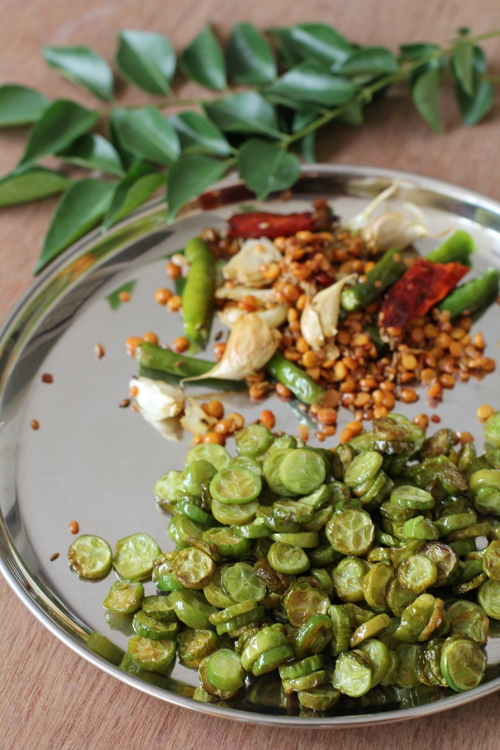 Once the seeds jump around, add red chili, curry leaves and saute for few seconds. Pour over the chutney. 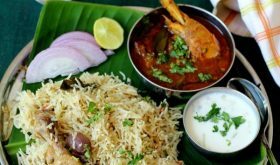 Serve with hot rice and a dollop of ghee. Those who do not garlic can avoid it and add a large pinch of hing during tempering/tadka. 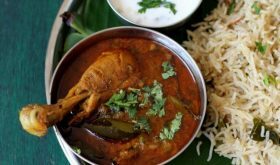 By Sailu Published: March 12, 2013 Simple chutney like Dondakaya pachadi with warm rice is comfort food for me. 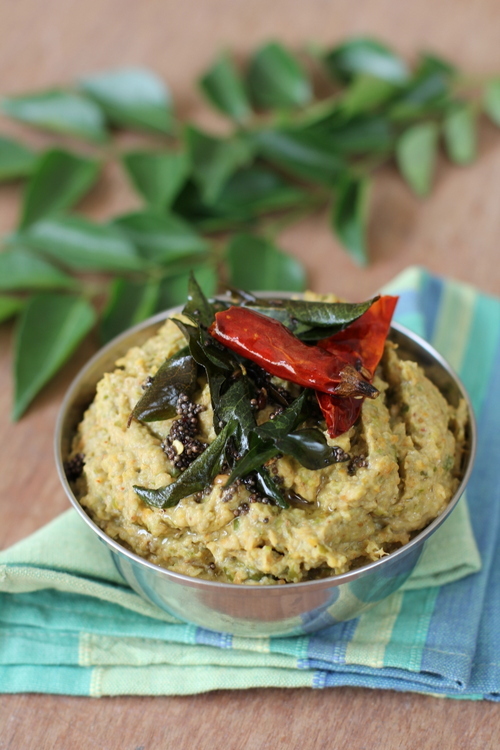 Andhra veg recipes boast of numerous chutney recipes that delight our soul. Lovely Pachadi! Tindora is one my favorites too. 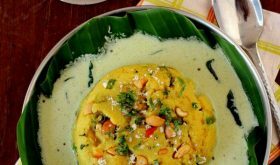 I think this pachadi would go very well not just with rice but also with dosa!! I should try. 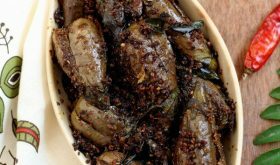 I too cook Ivy Gourd in our kitchen almost every week. Next week I will try this recipe. Hi Sailu, Recipe looks interesting. I am a big fan of the chutneys served in the Andra restaurants. Do you use garlic with the peel while frying ?? Often I saute crushed garlic with peel so that I do not burn the garlic while sauteing with other vegetables. If not sauteing with other vegetables, I usually use crushed and peeled garlic. 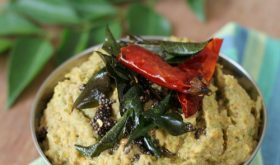 Veryn Interesting Recipe… Will give it a try..
what can i use to replace tamarind in chutneys? Tamarind may be replaced with Amchoor – Dry mango powder / Kokum / Lemon juice / cooked tomatoes.